Cookistry: Hey, Santa! Listen Up! At this time of year I should already have my Christmas wish list compiled, but it's getting to the point that there's not much else that I want, much less need, in my kitchen. That's what I think until I go browsing websites. Then I get the "Oh, I like that" reaction when I see something I hadn't thought about before. I try avoid temptation, but it's danged easy to wander from looking at cooking shows and recipes on the Food Network to shopping there. Yes, that's the place where all of my favorite and un-favorite Food Network personalities are gathered together in one big marketplace. Sigh. It's just too much fun to go from one cooking celeb to the other, to browse the bakeware, and pretend I'm immune to all of the glitz and spritz and shiny sharp things. But then I saw it. The very first episode of Good Eats I ever saw (we were a little slow getting cable) was when Alton Brown was drying herbs using a box fan and furnace filters. I was fascinated. And then I was hooked. I taped his shows, I watched reruns, I copied recipes off the Food Network site, and I made ALL THREE VERSIONS of his chocolate chip cookies. When it first came out, I got Alton Brown's book Good Eats: The Early Years because of course I had to have it. Had to. I read it from cover to cover, laughing at the little bits from the episodes and giddy to have those recipes all in one place, along with all the tips and factoids and humor. Gah. I'm such a geek-fan. When I perused the recipes with a more serious focus, and I found his potato soup recipe. I've made a lot of potato soup. I've made a lot of potato leek soup. I know I watched the episode where this soup was introduced, but I never thought about making the soup. Yeah, I enjoyed watching the episode and I probably learned something obscure about potatoes, but I didn't go look up the recipe because potato soup is so easy. But when I saw it in the cookbook, it intrigued me because it had a few ingredients that I never thought about using. So I made the soup. It was different from my usual, but really good. When I got to the end of the book, I was sad. Because there were MORE EPISODES that weren't written about. I wanted more Good Eats. More! More! More! 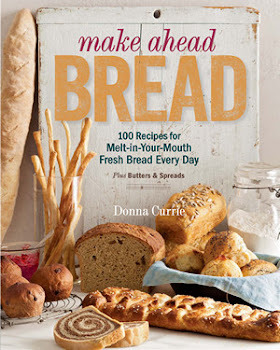 Hi, my name is Donna and I am a cookbook addict... with the patience of a toddler. Okay, yeah, I knew there had to be another book in the works because of the subtitle. And this year, I sort of knew the book was out, but I had other things on my mind ... and then there it was for sale, like geeky manna from Gutenberg: Good Eats 2: The Middle Years. Sigh. I really don't need another cookbook. Want is a whole 'nother thing.